In Greek tradition, it is Saint Basil – Ai-Vasilis – who brings gifts to children on his feast day, January 1st. Always true to tradition, the Boston Lykeion Ellinidon also received a visit from Ai-Vasili this New Year’s – along with a generous gift from the Folklife & Ethnological Museum of Macedonia-Thrace. The museum donated a set of eight authentic women’s attires from the region of Florina, Macedonia to the Boston Lykeion Ellinidon. Each ensemble is composed of three garments: an undershirt (πουκάμισο), overcoat (πανωφόρι), and apron (ποδιά). The Lykeion Ellinidon chapters in Atlanta, London, Munich, Sydney and the Czech Republic also received sets. Originally part of a collection from the Society of Macedonian Studies, the apparel was donated to diaspora chapters of the Lykeion Ellinidon to strengthen ties to Greek heritage and help young people appreciate both the utility and the aesthetic qualities of traditional costume. 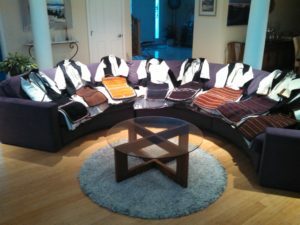 The eight ensembles will be included in the Boston Lykeion Ellinidon’s ongoing inventory project, an initiative to catalog, restore, and expand the organization’s collections of authentic attires and other textiles, which are used for performances, exhibitions and educational activities. Visit our Department of Traditional Attire and Decorative Arts page to learn more.